Just how low can a black hole go? Sometimes there are news stories with so much awesomeness to them it’s hard to describe it all. This is one such item. It starts with a bruiser of a star cluster, and ends with astronomers scratching their heads over black holes. C’mon, I’ll show you how this works. What’s amazing about this stellar city is that it’s loaded with high-mass stars. Almost every star you see there is what astronomers call type O or B; beefy stars with 10 to as much as 40 times the mass of the Sun. Each of these is incredibly luminous, some shining thousands of times more brightly than the Sun — and some with millions, yes millions of times the energy output of the Sun. If we put the Earth next to one of these guys, we’d burn. Hard. Stars like that don’t live very long — the more massive a star is, the shorter its life — so we know the cluster is young, and studies have shown that it’s about 5 million years old. Not only that, but it appears that all the stars were born at the same time. Sometimes there are waves of star formation in a cluster, but this one formed all at once, in what must have been a spectacular vision of gas, shock waves, and radiation. This all-at-onceness is critical, so keep it in mind! 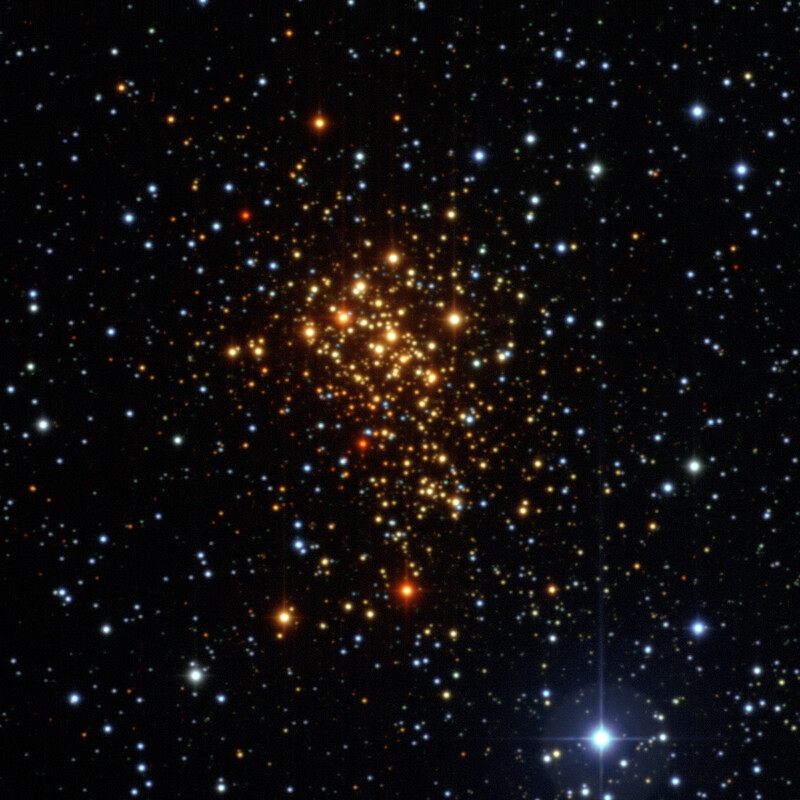 In the image, two stars are marked. At the lower left is a circle marking the location of a magnetar, the actual star (haha!) of our story. Magnetars are a special class of neutron stars, über-dense nuggets of material with the mass of the entire Sun squeezed into a ball just a few kilometers across. They are the remnants of supernovae, the leftover core that remains after the outer parts of a high-mass star explode. You can’t see the magnetar in the image because it’s very faint in visible light; it’s too small to be able to emit enough light for us to see. I’ll note, though, that it’s pouring out X-rays, which is how it was discovered. In fact, it’s emitting as much energy in just X-rays as the Sun does across the entire electromagnetic spectrum! Magnetars are a little bit scary. Now follow along here: if a star has enough mass, when it explodes it leaves behind a black hole. The core has so much gravity that when it collapse, it collapses all the way. But if the star is less massive, the core doesn’t have the oomph it needs to form a black hole, and instead forms a neutron star. They’re superdense, but not quite black holes. We think the dividing line between stars massive enough to make black holes and those that make neutron stars rests around 20 or so times the mass of the Sun. Below that, neutron star. Above it, black hole. Well, maybe not. Come along, there’s more to see. We can’t measure the mass of the magnetar directly. It sure would be nice to do that, since we could learn tons about it if we could know exactly how big and massive it is. But, it turns out, there’s a way to figure out how massive its long-ago exploded parent star was. Another star is indicated in the picture above. It’s called W13, and it’s a binary, two stars orbiting each other (they’re so close together they appear as one star in the image). That’s very important! Hundreds of years ago, astronomer Johannes Kepler figured out that if you can observe two objects orbiting each other — a planet around a star, a moon around a planet, or even two stars circling — you can calculate their masses. It’s a standard technique we’ve been using for a long time. So some astronomers did just that, and found that the two stars comprising W13 have masses of about 35 and 23 times that of the Sun — big stars, to be sure! And these kinds of stars usually start off their life even more massive: they lose mass over time by blowing a thick super-solar wind. So the bigger of the two probably was born with a mass of 40 times that of the Sun. Let’s put the pieces together. We have a young cluster of massive stars, and we’re pretty sure they were born all at once. The more massive a star, the shorter its lifespan. We also know that there exists in the cluster a star with about 35 times the mass of the Sun, and it started with about 40. We can therefore be pretty sure that any star more massive than that would’ve exploded by now, and also that any star that already has exploded would have started off more massive than that, too. But we also see a magnetar in the cluster. That means the star that formed it must have had a mass of at least 40 times the mass of the Sun or so! But wait! I said earlier the most massive star that can form a neutron star is about 20 times the mass of the Sun. Uh oh. That’s trouble. And that’s why this is awesome. All the evidence points to the fact that we’re really not quite so sure how massive a star can be to form a neutron star. And that means we’re also not so sure how massive a star has to be to form a black hole. When I give talks about this, I usually say a star more massive than about 20 times the mass of the Sun forms a black hole. What this star is telling us is that it’s not quite so simple. I love it when that happens! The Universe is more complicated and more interesting than we first thought. That’s always cool. So what’s going on here then? There are lots of steps in this detective puzzle, and there could be several places we’ve gone awry. For one thing, maybe the stars in the cluster weren’t all born at exactly the same time, throwing off our timescale. Maybe there is some property of the gas in the cluster from which the stars formed which throws off our clocks. Maybe the masses of the two components of the binary star are off. 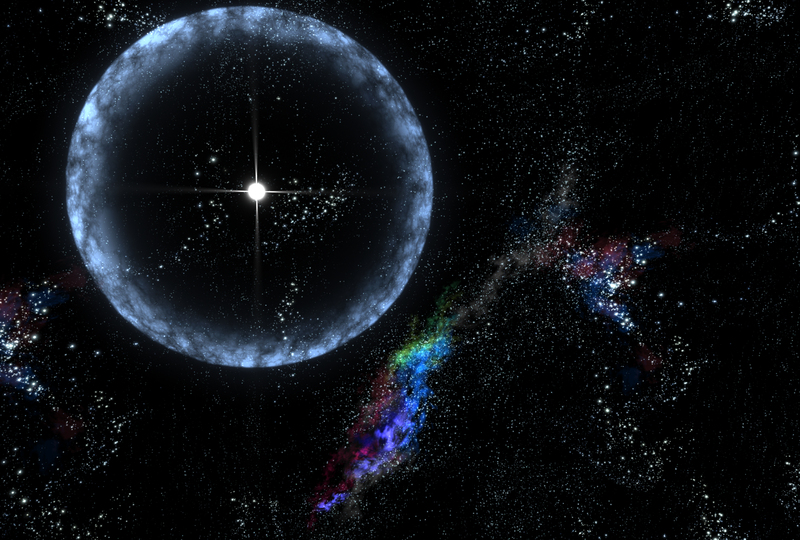 We think progenitor stars of magnetars have to be binaries themselves, and maybe something there affects the outcome. Maybe maybe maybe. But I read the journal research paper, and the scientists involved take into account a lot of potential problems, and still conclude the star that formed the magnetar was a whopper, far larger than we thought could do the trick. And while this is only a single example, and therefore difficult and dangerous to extrapolate from, it does provide an example of a star that should have formed a black hole, but didn’t. Why not? Was it spinning more rapidly than usual (magnetars have extremely rapid rotations)? 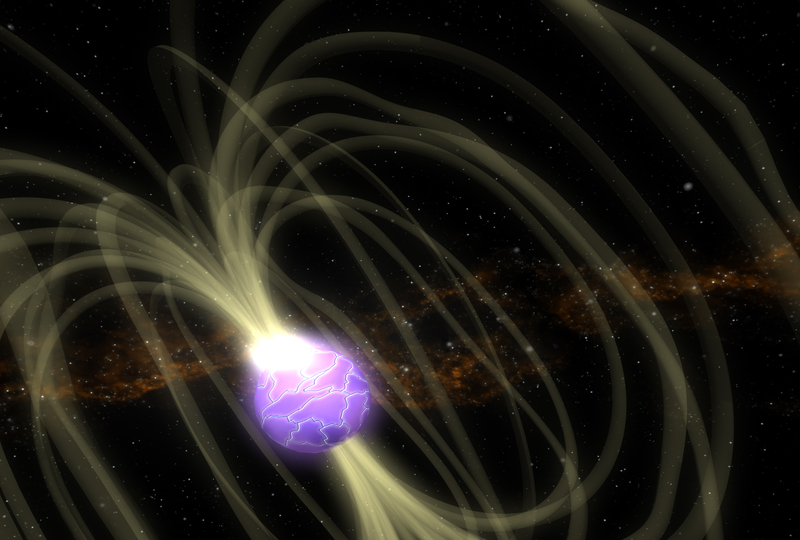 Was the magnetic field of the star critical (a magnetar’s most important feature is an incredibly strong magnetic field, a quadrillion — 1,000,000,000,000,000 — times that of the Earth)? Or is there something else we’ve missed? This calls into question what we know about how black holes form, too. A star with a mass like that forming a neutron star instead of a black hole changes how we think about them. It may mean black holes are harder to form, and there may be fewer of them than we thought. This is how science works, folks. We make observations, draw conclusions, then test them. Sometimes our ideas hold up, and sometimes they don’t. Sometimes the problems are easy to fix — tweak the idea here or there, or add a new bit to it — and sometimes not so much. But we draw on previous conclusions to make progress, and in this case a series of observations and analyses, each relying on older ideas, has led us to a conclusion that something we thought we understood is more complicated than we supposed. And this is how the Universe works, folks. It’s amazing, astonishing, beautiful, and frightening… but it’s rarely simple.